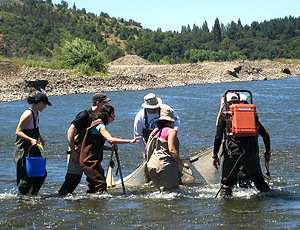 Students in an international workshop Flegal helped teach received training on how to sample environmental parameters in the Bio Bio River in Chile. Photo courtesy of A. R. Flegal. A report on global pollution for the United Nations Environment Program (UNEP) is one of several projects keeping environmental toxicologist Russell Flegal busy during a six-month visit to Chile as a Fulbright Scholar. 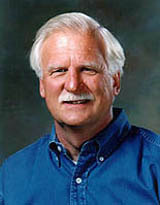 Flegal, a professor of microbiology and environmental toxicology at UC Santa Cruz, is also teaching a course on environmental pollution and doing research at the University of Concepción. His research projects include studies of metal pollution of rivers from mining and other industrial discharges, the long-range transport of industrial aerosols, and the environmental impacts of hydroelectric dams and industrial developments in Patagonia. For the UNEP report, Flegal is collaborating with colleagues from Chile and other countries. He also recently helped teach a short course on watershed management for a group of Canadian and Latin American students. "I'm also working on ways to develop ongoing collaborations between students and faculty in Chile and at UCSC," Flegal said. The Fulbright Scholar Program sends 800 U.S. faculty and professionals abroad each year. Grantees lecture and conduct research in a wide variety of academic and professional fields. The Fulbright Program is sponsored by the U.S. Department of State, Bureau of Educational and Cultural Affairs.